This article is dedicated to the one of the most successful Indian cricketer - Dilip Vengsarkar. Dilip is part of the three world cup teams in 1979, 1983 and 1987. Here is given the profile, career and records of this former cricket player. Dilip Vengsarkar who was born on 6 April 1956 at Rajapur city of Maharashtra, is an Indian cricketer in the role as a batsman in the Indian Team. He was regarded as one of the successul batsman in the Indian squad in the 80's. He was also the member 1983 World Cup winning team. Apart from the 1983 World Cup he has also played in the 1979 and 1987 Cricket World Cups. In 1975, Vengsarkar started playing for Bombay in domestic cricket. After a year of gap he soon got chance to play for Indian National Team in a Test against New Zealand. But his success comes at the Australian Tour in 1977-78. Soon ater that, in the home series against Pakistan, he played an unbeaten century of 146 runs while chasing a score of 390. Inspite of his efforts the match still went on to a draw. Dilip Vengsarkar was a prominient batsman of Indian Team for more than a decade. He scored runs in almost everywhere in the world. Lord's was his favourite venue. He has the record of scoring three consecutive centuries at Lord's, which is also called as the Mecca of Cricket. He was also the Man of the Series in the famous series won by India against England in England. He was also the Wisden Cricketer of the year 1987. At the time of his retirement he was second highest run maker in Test Cricket from India after Sunil Gavaskar. 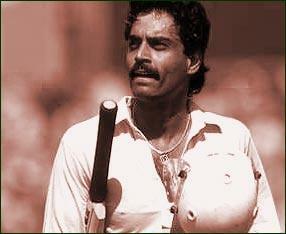 Vengsarkar has also played in the shorter form of cricket with than 100 Matches and 35,00 runs in his account. He played in three Cricket World Cups for India in 1979, 1983 and 1987. Under the captaincy of Kapil Dev, he was the member of the world cup winning team of 1983. He just played in couple of matches of the tournament.